RRB Assistant Loco-pilot and Technician Notification in 2018 has been released 26502 vacancies by the Indian Railway Recruitment Board. RRB 2018 new examination pattern consists of paper-1 and paper-2. Paper-1 consists of subjects like Mathematics,General Intelligence & Reasoning,General Science and General awareness. Part A consists of subjects like Mathematics , General Intelligence and Reasoning ,General awareness and Basic Science and Engineering. Part B consists of subjects like Mathematics, General Intelligence and reasoning, Basic Engineering and General awareness. 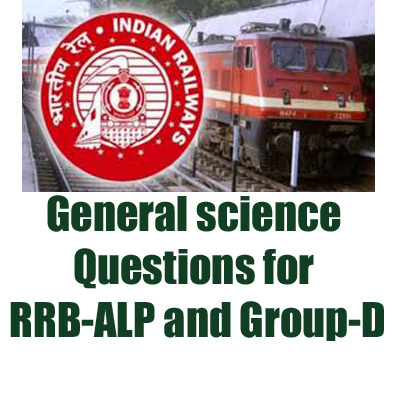 Here we are providing top 15 Fundamental General Science and General awareness questions which are expected to come in Assistant loco pilot (ALP) or Group-D railway exam 2018.